The front, back and sides provide surfaces that are ideal for years of play, stimulation and exercise. Whether the child is just learning how to use their arms and legs to manipulate themselves, or refining their gross motor skills the Climb N' Balance provides everything they need! The Climb N' Balance comes as two quarter circle pieces that can be used individually for physical coordination in play, or can be easily attached together to form a semi-circle for even more fun and play. 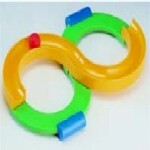 Included with the two quarter circle pieces are plastic sheaths to attach to the ends to prevent slippage. 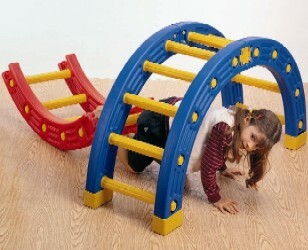 Also included, are secure connecting plates for use to create a semi-circle (full circle if used with 2 Climb N' Balance sets). Each piece is 34" long and 16 1/2" wide. How many Climb N' Balance sets would you like? 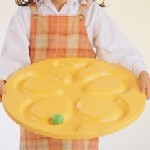 Just 1 set please 2 sets please to make a full circle! Want a toy for your child that significantly improves hand-eye coordination and reflex skills while taking up a minimal amount of space? The Infinite Loop does just that!